Everyone arrived in good shape and ready to go. No lost luggage and no delays. First Mass on shore of Galilee (great intro homily here). Everyone is now in bed along the shore of Gallilee ready for a big day tomorrow. It is always great to watch pilgrims see the Holy Land for the first time on the first day. What an excellent beginning! We started out with Mass atop the Mount of Transfiguration (homily here. Next we had renewals of wedding vows in Cana of Galilee. Free rest of the afternoon at the hotel to enjoy the Sea of Galilee and a great dinner. Great day, beautiful weather! Mass on the shore of Galilee with waves splashing at Primacy of Peter. Excellent homily here. 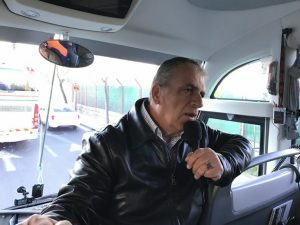 Continued further into Golan Heights to Druze restaurant for a unique lunch experience before stopping at the Syrian border to look and see and discuss the politically-incorrect version of the Middle East situation. Kursi where Jesus cast the demons into 2,000 pigs before two hours free time to swim in the Sea of Galilee and rest before our gourmet dinner at Magdelena. Enjoy! Today was our big day of transition from Galilee south and up to Jerusalem. We started our day with Mass at Capernaum before visiting the Mount of Beatitudes. You can hear/see Fr.Alfonso’s homily homily here. From there we drove to the ancient 2,000 year old boat and went out on the Sea in a real boat which is a real treat for everyone and they all enjoyed it. Then to our favorite St. Peters Fish restaurant where everybody got to eat the same fish that Jesus and the apostles ate. Then we drove south and stopped at the Church of the Visitation before arriving at the Notre Dame Center in Jerusalem. We went through the checkpoint from Israel into the Palestinian West Bank and entered Bethlehem at 8 AM in the morning. We learned about olive wood carvings and icons and had time to shop before Mass in a cave at Shepherds Field where the angels appeared on the first Christmas Eve. Homily here. Lunch of falafils and shwarma before visiting the birthplace of Jesus in the Church of Nativity. Rosary in the Church of St. Catherine and the a rollicking fun evening of dinner and dancing! Today was a great day preparing for the Passion of Christ tomorrow. Mass at Gethsemane (moving homily here), the Paternoster Church on Mount of Olives, lunch at a kibbutz, my 30 minute talk overlooking Jerusalem about the story of salvation history. Then we went to the Mount Zion to visit the place Mary fell asleep, the upper room and St. Peter in Gallicantu where Jesus was kept in prison over Holy Thursday. We did a tour of the holy shroud exhibit A good dinner and early to bed. Enjoy! 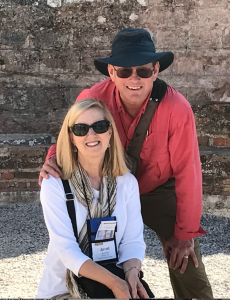 In some ways today is the pinnacle of the whole pilgrimage, which is why we start up in Galilee and end up in Jerusalem for the Passion of Christ. Up early in the morning each carrying their own cross as we pray the Stations of the Cross we all arrive at the Church of the Holy Sepulchre where we go directly up and touch the top of Calvary. We have Mass where Jesus was crucified and then a tour of the church (Gospel and Homily here). Back for breakfast, a group picture and then off to the Western Wall where we learn the history of this most important Jewish side and it’s meaning for us today as Catholics. A great lunch inside the Old City, entering the tomb of Christ to pray and touch our religious items, free time to explore on their own and then a great dinner on the rooftop of Jerusalem looking out over the Old City. Lots of fun and laughs. Enjoy! Closing homily at Notre Dame here. Scroll down to see our daily journal and YouTube videos and the videos shared by pilgrim Victor Feria. 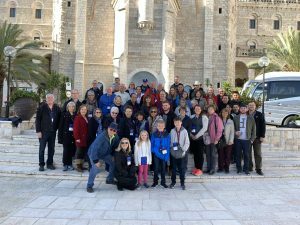 2018 December Holy Land Pilgrimage for Families from Steve Ray on Vimeo. You can also download the 2 hour long HD pilgrimage video HERE. 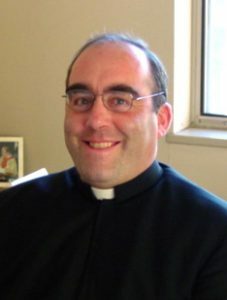 We have one of our favorite priests who will be our chaplain. He is a long time friend of Steve and Janet and has served them on many pilgrimages. He is from Madrid Spain and has a deep and profound love for the faith, a professor of theology and philosophy and is fun, accessible and devout. Everyone LOVES Fr. Alfonso Aquilar. Our priest will be announced soon but will be one of Steve and Janet’s favorite pilgrimage priests. Victor Feria’s 4 videos below. “Here sharing videos from our pilgrimage to the Holy Land. Some parts of the videos have biblical commentaries by Steve Ray and Historical insights by Amer Shehadeh, an Arab Roman Catholic who grew up in the area.